Late last summer, I bought a rhubarb plant at the flea market. I have no idea what variety it was -- I picked it up on a whim. I've tried to plant rhubarb before, with no luck. By no luck, I mean absolutely no luck. Bare roots, established plants, seeds -- you name it, I've tried it. Failure and rhubarb have become synonymous in my gardening lexicon. But, surrounded by milling throngs of bargain hunters on a hot, sunny morning in Indiana, I decided to give rhubarb one more try. My little last hurrah cost me $2.50. Poor little plant! It sat forlornly in it's little nursery pot for several months -- languishing for want of attention and a home of it's own. But, given my poor success with planting rhubarb, I didn't wasn't in a hurry to get it planted let alone established because I wasn't exactly sure where to try to plant this one. I'd tried many locations in my yard, and even considered planting it in the no-till garden over the winter -- but I wanted to hoop the beds and didn't think that this would be the right environment either. 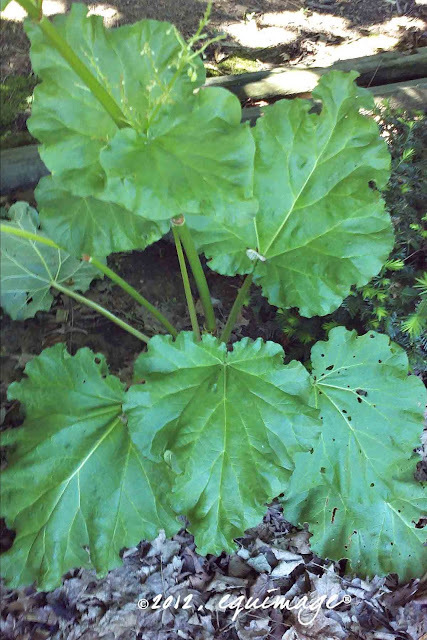 As the weather grew colder I decided to just heel it into the ground in a fairly sheltered place and move it in spring -- a longshot at best, given my rhubarb track record. I dug a hole between two evergreens, stuck it in the ground, covered it up -- and promptly forgot about it. During an early spring survey of my garden, I noticed this new plant, that seemed to be flourishing stuck there between two yews. I knew it was beautiful, knew it was doing well, and from the looks of the earth around it, knew I'd planted it. But what the heck was it? Then, I noticed the distinctive red-hued stripes on the stalks that held up rather large plate-like leaves and realized that this was my scrawny rhubarb plant from the fall. It's in partial shade but it seems to love its last-minute home so I think I'll leave it where it is and see how it fares the rest of the season. It may end up living exactly where it is -- slightly off center between two yews, somewhat hidden from view but growing great guns. What do you know... even a blind chicken finds a kernel of corn once in awhile! I found this recipe on MarthaStewart.com and decided it was just the perfect rhubarb recipe for my soon to be harvested rhubarb! Maybe I'll make it for myself for mother's day! To view the recipe just click on the cake image below and it will take you to a link in my Pinterest feed. 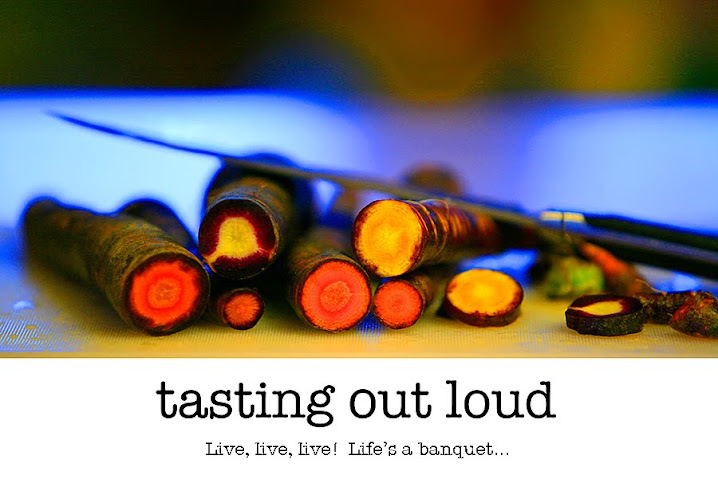 ©Tasting Out Loud, 2011. All images ©Equimage Media. All rights reserved. No Tasting Out Loud content may be reproduced without permission. Please ask first. ... life's a banquet and most poor suckers are starving to death!" All Material ©Equimage® Media for Tasting Out Loud, 2010. All Rights Reserved. Please ask before using any material, written or photographic.